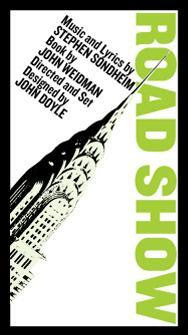 Just when you may have thought everyone either loved or hated the latest revision to Stephen Sondheim's ever-gestating musical, currently called Road Show, I'm here to tell you that I merely liked John Doyle's interpretation. But that's infinitely better than where my own personal journey began with this Road Show. Just over five years ago, I took in the overbloated Goodman Theatre production of the tuner's precursor of Bounce in Chicago, which included a major love storyline barely hinted at in the streamlined Public Theater staging. With John Weidman's book and Sondheim's Assassinsesque score substantially whittled, Doyle's decidedly darker direction ironically gives Road Show its, er, bounce. It doesn't hurt that the largely comic verve in Chicago has been replaced by a more serious, sinister examination of Addison and Wilson Mizner, the real-life brothers who sought fame and fortune (the former was credited with launching a "Florida Renaissance" via his architecture in Palm Beach and Boca Raton, while the latter wrote three Broadway shows staged between 1909 and 1912). Set against another troubling economic time, Doyle mines the material to maximum cautionary impact, including through his own ingenious scenic design. In the single best performances I've yet to see from frequent Sondheim interpreters Michael Cerveris and Alexander Gemignani, the actors offer measured portrayals of Wilson's greedy self-destruction and Addison's yearning to rise above it, respectively. While Gemignani wrings pathos from his Addison, Cerveris' Wilson is purely and perfectly pathetic ... and highly entertaining. Will Road Show someday find its place among the most revered in Sondheim's canon? While it's nowhere near that, yet, it's certainly come a long way. This was my first experience with Bounce/Road Show. Although I didn't think it was perfect, I was on the side of those who liked it quite a bit. I liked the whole dark tone, the Assassins-esque score and the way it examines certain traits of human nature - our desire to remake ourselves and to get rich quick. I also found Michael Cerveris very entertaining. I liked the way some of his musical numbers were staged, including the one that describes Wilson's experiences in New York and the land scheme in Boca Raton. Even though it was over the top I liked all of the money strewn about! And "The Best Thing That Ever Has Happened" is a beautiful song.